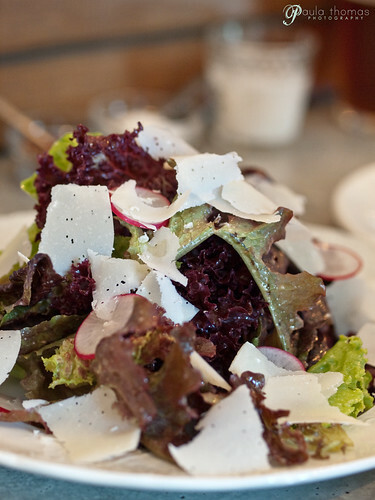 Mark and I have been to Delancey three times now and realized I haven't blogged about it yet. 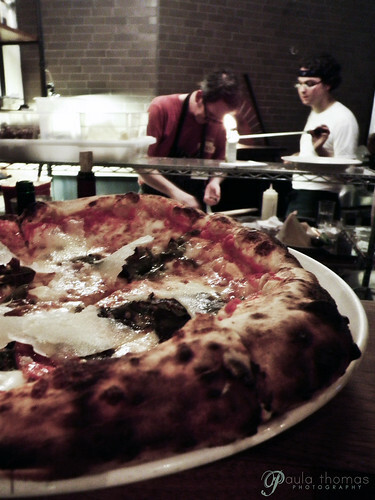 Delancey serves up some of the best wood-fire pizzas in Seattle. It's owned by the husband/wife team, Brandon Pettit and Molly Wizenberg. I think most people hear about the place by word of mouth because everyone talks about how good they are. I think I first heard about them from Matthew, aka suomynona via his zillion Flickr photos from the place. Ok so that's a bit of an exaggeration, it's actually 395 photos as of this blog post. I have no idea how many times he's been there but I think at one point he ate there every day for 30 something days. Saying he's a regular is probably an understatement. He probably calls it his second home. Each time we've gone to Delancey, we got their just before opening so we could cozy up to the bar. The first time there was a pretty long line and we ended up having to wait, but it was worth it. 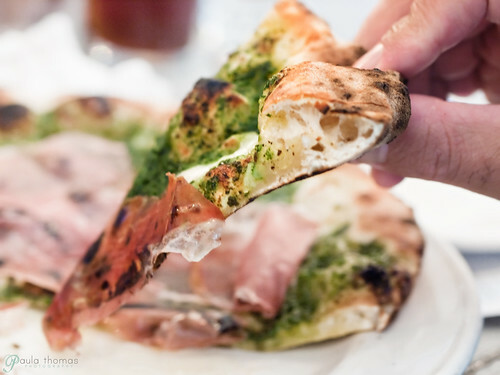 We started with a baby lettuce salad and got the pizza special which was topped with arugula pesto, fresh mozzarella, Leporati prosciutto di Parma, & 10-year balsamic. We just had to go again a few weeks later after Matthew posted photos and tweeted about the padron pizza which is around. It's only available for a limited time, while the peppers are in season, so we had to go before they were gone. We got a seat at the bar again and discovered Matthew was also there that night for the padron. 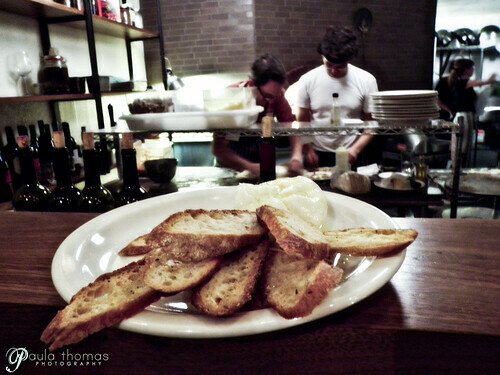 We tried one of the other starters this time and got the toasted baguettes with Burrata. I had never tried or even heard of burrata before. It had a very unusual texture, like a buttery, creamy, mozzarella cheese. The padrons were indeed spicy and oh so good. We rarely ever think of getting dessert but Matthew surprised us with chocolate chip cookies. We were too full so took the cookies home for later. I think it might have been the best chocolate chip cookie I've ever had. What pushed this cookie to the top was the lovely gray sea salt that was sprinkled on the top. I think it was then that I realized how much a sprinkle of salt can make a difference. 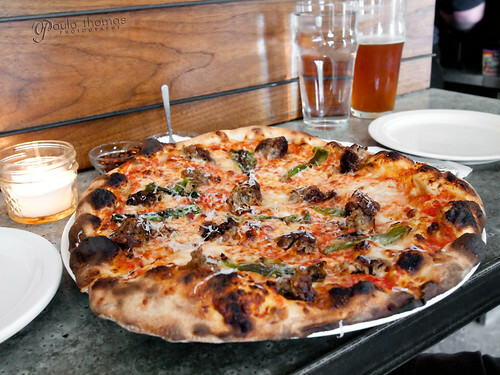 We went again this year not long after their first year anniversary to get the padron pizza while in season. We were one of the first people in line and got the first pizza out of the oven. This time we got our padrons with some of Delancey's homemade pork fennel sausage. It was the perfect combination. If you haven't given Delancey a try yet, I would recommend it, especially while the padron peppers are available. Love your shot of the special pizza. Looking forward to Brandon announcing it's return on Twitter.